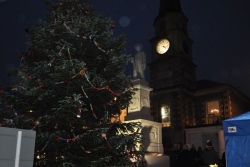 Selkirk has celebrated its improved town centre as part of its annual Christmas lights switch-on ceremony. A day of festive fun culminated in the official opening of the Selkirk Streetscape Scheme and renovated Sir Walter Scott Courthouse, marked by a ribbon cutting ceremony in front of the Courthouse, with the iconic building’s refurbished clock faces and stained glass window switched on for the occasion. Logan Fairbairn, Rowland’s Year of the Young Person winner, carried out the ribbon cutting duties immediately prior to the Christmas lights switch on, with hundreds of local people in attendance. The £431,000 Courthouse restoration was the centrepiece of the Selkirk Conservation Area Regeneration Scheme (CARS) and has safeguarded the town centre building - where Sir Walter Scott dispensed justice to the people of Selkirkshire in the early 19th century – for many years to come. Works on the building were extended thanks to additional funding from Selkirk Common Good and us and included repairs to the cockerel weather vane, refurbishment of the clock faces and extensive repairs to its defective stonework. The Courthouse works were co-ordinated alongside the £450,000 Selkirk Streetscape Scheme, which has resulted in various improvements to the town centre including safer access for bus passengers, better seating, improved pedestrian crossings, better road surfacing for drivers and provision for Market Place to host events and markets. The plans for the streetscape scheme involved consultation with the Selkirk Stakeholder Group which included 15 different organisations from the town. It has already proved a success, with a farmers market now a popular monthly event in the Market Place. “We are delighted both of these projects have now concluded and as we head into a bright future for Selkirk, it was fantastic to have one of our young people take part in the official opening. “The works to the Courthouse will ensure the long-term future of the building, which is iconic to Selkirk and the town’s proud links to Sir Walter Scott. It also marks the final works of Selkirk CARS, which has invested over £1million in the town centre and revitalised a number of properties. “The Selkirk Streetscape Scheme has led to a wide variety of improved facilities in Market Place for local people, which are already helping to attract more visitors to the Royal Burgh. Images of the Farmers Market and Streetscape and Courthouse openings are available at our Flickr page. The scheme was developed with our Engineering Design team and landscape architects. Selkirk Conservation Area Regeneration Scheme (CARS) was a partnership project developed along with the community-based Selkirk CARS Steering Group. Funding was successfully obtained from Historic Scotland in January 2013 and the project will run until March 2018. Selkirk CARS is focused on a range of heritage and conservation-based regeneration activities within the town centre over a five year period. The project has an overall budget of just over £1million, funded by Historic Scotland (£795,000) and us (£215,000). Selkirk CARS also part funded the Selkirk Streetscape Scheme.